The Industrial Revolution was a major shift of technological, socioeconomic, and cultural conditions that occurred in the late eighteenth and early nineteenth century in some Western countries. It began in Britain and spread throughout the world, a process that continues as industrialization. The onset of the Industrial Revolution marked a major turning point in human social history, comparable to the invention of farming or the rise of the first city-states; almost every aspect of daily life and human society was, eventually, in some way influenced by it. The effects spread throughout Western Europe and North America during the nineteenth century, eventually affecting most of the world. The impact of this change on society was enormous. "What caused the Industrial Revolution?" remains the most important unanswered question in social science. The period of time covered by the Industrial Revolution varies with different historians. Eric Hobsbawm held that it 'broke out' in the 1780s and was not fully felt until the 1830s or 1840s, while T. S. Ashton held that it occurred roughly between 1760 and 1830. Some twentieth century historians such as John Clapham and Nicholas Crafts have argued that the process of economic and social change took place gradually and the term revolution is not a true description of what took place. This is still a subject of debate amongst historians. As might be expected of such a large social change, the Industrial Revolution had a major impact upon wealth. It has been argued that GDP per capita was much more stable and progressed at a much slower rate until the Industrial Revolution and the emergence of the modern capitalist economy, and that it has since increased rapidly in capitalist countries. The term "Industrial Revolution" applied to technological change was common in the 1830s. Louis-Auguste Blanqui in 1837 spoke of la révolution industrielle. Friedrich Engels in The Condition of the Working Class in England in 1844 spoke of "an industrial revolution, a revolution which at the same time changed the whole of civil society." The idea of a new social order based on major industrial change was clear in Southey and Owen, between 1811 and 1818, and was implicit as early as Blake in the early 1790s and Wordsworth at the turn of the century. Credit for popularizing the term may be given to historian Arnold Toynbee, whose lectures given in 1881 gave a detailed account of the process. The causes of the Industrial Revolution were complex and remain a topic for debate, with some historians seeing the Revolution as an outgrowth of social and institutional changes brought by the end of feudalism in Britain after the English Civil War in the seventeenth century. As national border controls became more effective, the spread of disease was lessened, therefore preventing the epidemics common in previous times. The percentage of children who lived past infancy rose significantly, leading to a larger workforce. The Enclosure movement and the British Agricultural Revolution made food production more efficient and less labor-intensive, forcing the surplus population who could no longer find employment in agriculture into cottage industry, for example weaving, and in the longer term into the cities and the newly developed factories. The colonial expansion of the seventeenth century with the accompanying development of international trade, creation of financial markets and accumulation of capital are also cited as factors, as is the scientific revolution of the seventeenth century. Technological innovation was the heart of the industrial revolution and the key enabling technology was the invention and improvement of the steam engine. The historian, Lewis Mumford has proposed that the Industrial Revolution had its origins in the early Middle Ages, much earlier than most estimates. He explains that the model for standardized mass production was the printing press and that "the archetypal model for the [industrial era] was the clock." He also cites the monastic emphasis on order and time-keeping, as well as the fact that Medieval cities had at their center a church with bell ringing at regular intervals as being necessary precursors to a greater synchronization necessary for later, more physical manifestations such as the steam engine. 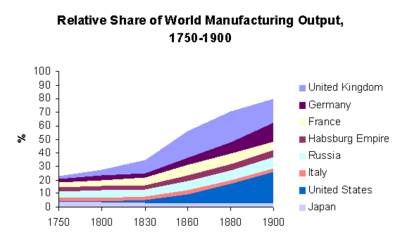 The presence of a large domestic market should also be considered an important driver of the Industrial Revolution, particularly explaining why it occurred in Britain. In other nations, such as France, markets were split up by local regions, which often imposed tolls and tariffs on goods traded among them. Governments' grant of limited monopolies to inventors under a developing patent system (the Statute of Monopolies 1623) is considered an influential factor. The effects of patents, both good and ill, on the development of industrialization are clearly illustrated in the history of the steam engine, the key enabling technology. In return for publicly revealing the workings of an invention the patent system rewards inventors by allowing, e.g., James Watt to monopolize the production of the first steam engines, thereby enabling inventors and increasing the pace of technological development. However monopolies bring with them their own inefficiencies which may counterbalance, or even overbalance, the beneficial effects of publicizing ingenuity and rewarding inventors. 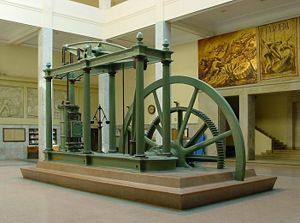 Watt's monopoly may have prevented other inventors, such as Richard Trevithick, William Murdoch or Jonathan Hornblower, from introducing improved steam engines thereby retarding the industrial revolution by up to 20 years. European seventeenth century colonial expansion, international trade, and creation of financial markets created the legal and financial structures that could be used to invest in the new industrial infrastructure. One question of active interest to historians is why the Industrial Revolution started in eighteenth century Europe and not in other parts of the world in the eighteenth century, particularly China, India, and the Middle East, or at other times like in Classical Antiquity or the Middle Ages. Numerous factors have been suggested, including ecology, government, and culture. Benjamin Elman argues that China was in a high level equilibrium trap in which the non-industrial methods were efficient enough to prevent use of industrial methods with high costs of capital. Kenneth Pomeranz, in the Great Divergence, argues that Europe and China were remarkably similar in 1700, and that the crucial differences which created the Industrial Revolution in Europe were sources of coal near manufacturing centers, and raw materials such as food and wood from the New World, which allowed Europe to expand economically in a way that China could not. However, most historians contest the assertion that Europe and China were roughly equal because modern estimates of per capita income on Western Europe in the late eighteenth century are of roughly 1,500 dollars in purchasing power parity (and Britain had a per capita income of nearly 2,000 dollars whereas China, by comparison, had only 450 dollars. Also, the average interest rate was about 5 percent in Britain and over 30 percent in China, which illustrates how capital was much more abundant in Britain; capital that was available for investment. Some historians such as David Landes and Max Weber credit the different belief systems in China and Europe with dictating where the revolution occurred. The religion and beliefs of Europe were largely products of Judaeo-Christianity, and Greek thought. Conversely, Chinese society was founded on men like Confucius, Mencius, Han Feizi (Legalism), Lao Tzu (Taoism), and Buddha (Buddhism). The key difference between these belief systems was that those from Europe focused on the individual, while Chinese beliefs centered around relationships between people. The family unit was more important than the individual for the large majority of Chinese history, and this may have played a role in why the Industrial Revolution took much longer to occur in China. There was the additional difference of outlook. In traditional societies, people tend to look backwards to tradition for answers to their questions. One of the inventions of the modern age was the invention of progress, where people look hopefully to the future. Furthermore, Western European peoples had experienced the Renaissance and Reformation; other parts of the world had not had a similar intellectual breakout, a condition that holds true even into the twenty-first century. Regarding India, the Marxist historian Rajani Palme Dutt has been quoted as saying, "The capital to finance the Industrial Revolution in India instead went into financing the Industrial Revolution in England." In contrast to China, India was split up into many competing kingdoms, with the three major ones being the Marathas, Sikhs and the Mughals. In addition, the economy was highly dependent on two sectors—agriculture of subsistence and cotton, and technical innovation was non-existent. The vast amounts of wealth were stored away in palace treasuries, and as such, were easily moved to Britain. The debate about the start of the Industrial Revolution also concerns the massive lead that Great Britain had over other countries. Some have stressed the importance of natural or financial resources that Britain received from its many overseas colonies or that profits from the British slave trade between Africa and the Caribbean helped fuel industrial investment. It has been pointed out, however, that slavery provided only 5 percent of the British national income during the years of the Industrial Revolution. Alternatively, the greater liberalization of trade from a large merchant base may have allowed Britain to produce and utilize emerging scientific and technological developments more effectively than countries with stronger monarchies, particularly China and Russia. Britain emerged from the Napoleonic Wars as the only European nation not ravaged by financial plunder and economic collapse, and possessing the only merchant fleet of any useful size (European merchant fleets having been destroyed during the war by the Royal Navy). Britain's extensive exporting cottage industries also ensured markets were already available for many early forms of manufactured goods. The conflict resulted in most British warfare being conducted overseas, reducing the devastating effects of territorial conquest that affected much of Europe. This was further aided by Britain's geographical position—an island separated from the rest of mainland Europe. Another theory is that Britain was able to succeed in the Industrial Revolution due to the availability of key resources it possessed. It had a dense population for its small geographical size. Enclosure of common land and the related Agricultural Revolution made a supply of this labor readily available. There was also a local coincidence of natural resources in the North of England, the English Midlands, South Wales and the Scottish Lowlands. Local supplies of coal, iron, lead, copper, tin, limestone and water power, resulted in excellent conditions for the development and expansion of industry. Also, the damp, mild weather conditions of the North West of England provided ideal conditions for the spinning of cotton, providing a natural starting point for the birth of the textiles industry. The stable political situation in Britain from around 1688, and British society's greater receptiveness to change (when compared with other European countries) can also be said to be factors favoring the Industrial Revolution. In large part due to the Enclosure movement, the peasantry was destroyed as significant source of resistance to industrialization, and the landed upper classes developed commercial interests that made them pioneers in removing obstacles to the growth of capitalism. Another theory is that the British advance was due to the presence of an entrepreneurial class which believed in progress, technology and hard work.1 The existence of this class is often linked to the Protestant work ethic (see Max Weber) and the particular status of dissenting Protestant sects, such as the Quakers, Baptists and Presbyterians that had flourished with the English Civil War. Reinforcement of confidence in the rule of law, which followed establishment of the prototype of constitutional monarchy in Britain in the Glorious Revolution of 1688, and the emergence of a stable financial market there based on the management of the national debt by the Bank of England, contributed to the capacity for, and interest in, private financial investment in industrial ventures. Dissenters found themselves barred or discouraged from almost all public offices, as well as education at England's only two Universities at the time (although dissenters were still free to study at Scotland's four universities). 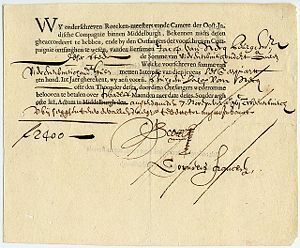 When the restoration of the monarchy took place and membership in the official Anglican church became mandatory due to the Test Act, they thereupon became active in banking, manufacturing and education. The Unitarians, in particular, were very involved in education, by running Dissenting Academies, where, in contrast to the Universities of Oxford and Cambridge and schools such as Eton and Harrow, much attention was given to mathematics and the sciences—areas of scholarship vital to the development of manufacturing technologies. In terms of social structure, the Industrial Revolution witnessed the triumph of a middle class of industrialists and businessmen over a landed class of nobility and gentry. 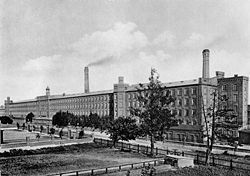 Ordinary working people found increased opportunities for employment in the new mills and factories, but these were often under strict working conditions with long hours of labor dominated by a pace set by machines. However, harsh working conditions were prevalent long before the industrial revolution took place as well. Pre-industrial society was very static and often cruel—child labor, dirty living conditions and long working hours were just as prevalent before the Industrial Revolution. Industrialization led to the creation of the factory. Arguably the first was John Lombe's water-powered silk mill at Derby was operational by 1721. However, the rise of the factory came somewhat later when cotton- spinning was mechanized. The factory system was largely responsible for the rise of the modern city, as workers migrated into the cities in search of employment in the factories. Nowhere was this better illustrated than the mills and associated industries of Manchester, nicknamed Cottonopolis, and arguably the world's first industrial city. For much of the nineteenth century, production was done in small mills, which were typically powered by water and built to serve local needs. Later each mill would have its own steam engine and a tall chimney to give an efficient draft through its boiler. The transition to industrialization was not wholly smooth. For example, a group of English workers known as Luddites formed to protest against industrialization and sometimes sabotaged factories, by throwing a wooden shoe (sabot) into the mechanical works. One of the earliest reformers of factory conditions was Robert Owen. In other industries the transition to factory production followed a slightly different course. In 1746, an integrated brass mill was working at Warmley near Bristol. Raw material went in at one end, was smelted into brass and was turned into pans, pins, wire, and other goods. Housing was provided for workers on site. Josiah Wedgwood and Matthew Boulton were other prominent early industrialists, who employed the factory system. The Industrial Revolution led to a population increase. Industrial workers were better paid than those in agriculture. With more money, women ate better and had healthier babies, who were themselves better fed. Child mortality rates declined, and the distribution of age in the population became more youthful. There was limited opportunity for formal education, and children were expected to work in order to bring home wages. Employers could pay a child less than an adult even though their productivity was comparable; there was no need for strength to operate an industrial machine, and since the industrial system was completely new there were no experienced adult laborers. This made child labor the labor of choice for manufacturing in the early phases of the industrial revolution. Child labor had existed before the Industrial Revolution, but with the increase in population and education it became more visible. Before the passing of laws protecting children, many were forced to work in terrible conditions for much lower pay than their elders. Reports were written detailing some of the abuses, particularly in the coal mines and textile factories and these helped to spread knowledge the children's plight. The public outcry, especially among the upper and middle classes, helped stir change in the young workers' welfare. Politicians and the government tried to limit child labor by law, but factory owners resisted; some felt that they were aiding the poor by giving their children money to buy food to avoid starvation, and others simply welcomed the cheap labor. In 1833 and 1844, the first general laws against child labor, the Factory Acts, were passed in England: Children younger than nine were not allowed to work, children were not permitted to work at night, and the work day of youth under the age of 18 was limited to twelve hours. Factory inspectors supervised the execution of the law. About ten years later, the employment of children and women in mining was forbidden. These laws decreased the number of child laborers; however, child labor remained in Europe up to the twentieth century. 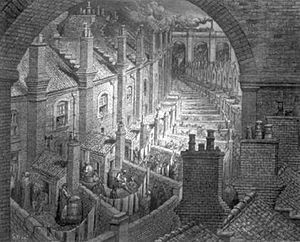 Living conditions during the Industrial Revolution varied from the splendor of the homes of the owners to the squalor of the lives of the workers. Cliffe Castle, Keighley, is a good example of how the newly rich chose to live. This is a large home modeled loosely on a castle with towers and garden walls. The home is very large and was surrounded by a massive garden, the Cliffe Castle is now open to the public as a museum. Poor people lived in very small houses in cramped streets. These homes would share toilet facilities, have open sewers and would be at risk of damp. Disease was spread through a contaminated water supply. Conditions did improve during the nineteenth century as public health acts were introduced covering things such as sewage, hygiene and making some boundaries upon the construction of homes. Not everybody lived in homes like these. The Industrial Revolution created a larger middle class of professionals such as lawyers and doctors. The conditions for the poor improved over the course of the 19th century because of government and local plans which led to cities becoming cleaner places, but life had not been easy for the poor before industrialization. However, as a result of the Revolution, huge numbers of the working class died due to disease spreading through the cramped living conditions. Chest diseases from the mines, cholera from polluted water and typhoid were also extremely common, as was smallpox. Accidents in factories with child and female workers were regular. Dickens' novels perhaps best illustrate this; even some government officials were horrified by what they saw. Strikes and riots by workers were also relatively common. The rapid industrialization of the English economy cost many craft workers their jobs. The textile industry in particular industrialized early, and many weavers found themselves suddenly unemployed since they could no longer compete with machines which only required relatively limited (and unskilled) labor to produce more cloth than a single weaver. Many such unemployed workers, weavers and others, turned their animosity towards the machines that had taken their jobs and began destroying factories and machinery. These attackers became known as Luddites, supposedly followers of Ned Ludd, a folklore figure. The first attacks of the Luddite movement began in 1811. The Luddites rapidly gained popularity, and the British government had to take drastic measures to protect industry. The Industrial Revolution concentrated labor into mills, factories and mines, thus facilitating the organization of combinations or trade unions to help advance the interests of working people. The power of a union could demand better terms by withdrawing all labor and causing a consequent cessation of production. Employers had to decide between giving in to the union demands at a cost to themselves or suffer the cost of the lost production. Skilled workers were hard to replace, and these were the first groups to successfully advance their conditions through this kind of bargaining. The main method the unions used to effect change was strike action. Strikes were painful events for both sides, the unions and the management. In England, the Combination Act forbade workers to form any kind of trade union from 1799 until its repeal in 1824. Even after this, unions were still severely restricted. In the 1830s and 1840s the Chartist movement was the first large scale organized working class political movement which campaigned for political equality and social justice. Its Charter of reforms received over three million signatures but was rejected by Parliament without consideration. Working people also formed friendly societies and co-operative societies as mutual support groups against times of economic hardship. Enlightened industrialists, such as Robert Owen also supported these organizations to improve the conditions of the working class. Unions slowly overcame the legal restrictions on the right to strike. In 1842, a General Strike involving cotton workers and colliers was organized through the Chartist movement which stopped production across Great Britain. Eventually effective political organization for working people was achieved through the trades unions who, after the extensions of the franchise in 1867 and 1885, began to support socialist political parties that later merged to became the British Labour Party. The application of steam power to the industrial processes of printing supported a massive expansion of newspaper and popular book publishing, which reinforced rising literacy and demands for mass political participation. During the Industrial Revolution, the life expectancy of children increased dramatically. The percentage of the children born in London who died before the age of five decreased from 74.5 percent in 1730 - 1749 to 31.8 percent in 1810 - 1829. Besides, there was a significant increase in worker wages during the period 1813-1913. The advent of The Enlightenment provided an intellectual framework which welcomed the practical application of the growing body of scientific knowledge—a factor evidenced in the systematic development of the steam engine, guided by scientific analysis, and the development of the political and sociological analyzes, culminating in Adam Smith's The Wealth of Nations. One of the main arguments for capitalism is that industrialization increases wealth for all, as evidenced by rising life expectancy, reduced working hours, and no work for children and the elderly. Marxism is essentially a reaction to the Industrial Revolution. According to Karl Marx, industrialization polarized society into the bourgeoisie (those who own the means of production, the factories and the land) and the much larger proletariat (the working class who actually perform the labor necessary to extract something valuable from the means of production). He saw the industrialization process as the logical dialectical progression of feudal economic modes, necessary for the full development of capitalism, which he saw as in itself a necessary precursor to the development of socialism and eventually communism. During the Industrial Revolution an intellectual and artistic hostility towards (or an emotional retreat from) the new industrialization developed. This was known as the Romantic movement. Its major exponents in English literature included the artist and poet William Blake and poets William Wordsworth, Samuel Taylor Coleridge, John Keats, Lord Byron and Percy Bysshe Shelley. The movement stressed the importance of "nature" in art and language, in contrast to 'monstrous' machines and factories; the "Dark satanic mills" of Blake's poem And did those feet in ancient time. Mary Shelley's short story Frankenstein reflected concerns that scientific progress might be two-edged. ↑ Robert E. Lucas, Jr., "The Industrial Revolution: Past and Future." 2003. Federal Reserve Bank of Minneapolis. Accessed 13 November 2006. ↑ Pat Hudson. The Industrial Revolution. (Oxford University Press US, 1992. ISBN 0713165316) Read it.Retrieved July 14, 2008. ↑ Phyllis Deane. The First Industrial Revolution. (Cambridge University Press. ISBN 0521296099) Read it.Retrieved July 14, 2008. ↑ Michele Boldrin and David K. Levine, Economic and Game Theory Against Intellectual Monopoly, PDF, 3. Retrieved July 14, 2008. ↑ J. Bradford DeLong, Professor of Economics, University of California at Berkeley, Why No Industrial Revolution in Ancient Greece? September 20, 2002. Accessed January 2007. ↑ Immanuel Chung-Yueh Hsu. The Rise of Modern China. (Oxford University Press US. ISBN 0195125045) Read itRetrieved July 14, 2008. ↑ Was slavery the engine of economic growth? Digital History Retrieved July 14, 2008. ↑ The Royal Navy itself may have contributed to Britain’s industrial growth. Among the first complex industrial manufacturing processes to arise in Britain were those that produced material for British warships. For instance, the average warship of the period used roughly 1000 pulley fittings. With a fleet as large as the Royal Navy, and with these fittings needing to be replaced ever 4 to 5 years, this created a great demand which encouraged industrial expansion. The industrial manufacture of rope can also be seen as a similar factor. ↑ Barrington Moore, Jr.. Social Origins of Dictatorship and Democracy: Lord and Peasant in the Making of the Modern World. (Boston, Beacon Press, 1966), 29-30. ↑ "Testimony Gathered by Ashley's Mines Commission." The Mines Act, 1842.victorianweb.org. ↑ "The Life of the Industrial Worker in Ninteenth-Century England." Testimonies, 1832, Parliamentary Hearings.victorianweb.org. ↑ Kirkpatrick Sale, "The Achievements of `General Ludd': A Brief History of the Luddites" The Ecologist 29 (5) (Aug/Sep 1999) online .mindfuly.org. Retrieved July 12, 2008. ↑ "Peoples' Charter" 1838. Chartism or The Chartist Movement. victorianweb.org. ↑ ScienceDirect - Explorations in Economic History: Trends in Real Wages in Britain, 1750-1913 sciencedirect.com. 17 July 2006. ↑ Industrial Revolution and the Standard of Living econlib.org. 17 July 2006. Brown, Lester Russell. Eco-Economy. James & James / Earthscan. ISBN 1853839043. Read it. Hughes, Thomas Parke. Development of Western Technology Since 1500. MacMillan, 1980. Mokyr, Joel. The British Industrial Revolution: An Economic Perspective. 1999. online edition. O'Brien, Patrick, and Roland Quinault, eds. 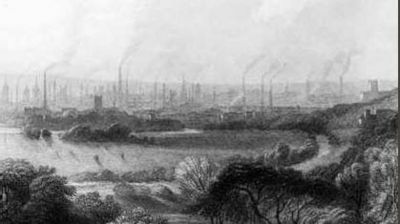 The Industrial Revolution and British Society. Usher, Abbott Payson. An Introduction to the Industrial History of England. 1920. Birch, A. The economic history of the British iron and steel industry 1784 to 1879. London: Cass, 1967. Hyde, C. K. Technological change and the British iron industry 1700-1870. Princeton NJ: Princeton University Press, 1977. King, P. W. "Sir Clement Clerke and the Adoption of Coal in Metallurgy." Transactions of Newcomen Society 73: 33-53. King, P. W. "The production and consumption of iron in early modern England and Wales." Economic History Review LVIII (2005): 1-33. Hart, Ivor Blashka. James Watt and the History of Steam Power. 1949. Pawson, Eric. Transport and Economy: the turnpike roads of 18th century England. New York, Academic Press, 1977. History of "History of the Industrial Revolution"
This page was last modified on 11 January 2018, at 16:34.